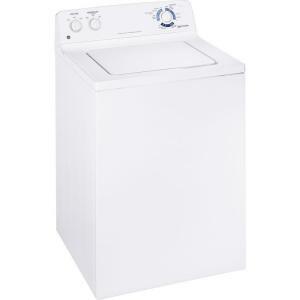 GE GTWP1000MWW Top-load Washer 3.4 Cu. Ft. Choose from up to 12 wash cycles with the GTWP1000MWW top-load washer from GE. With the GentlePower agitator, this washing machine won't cause too much strain on your clothes and other delicate laundry items. It also has the RainShower System that allows you to use less water per load. The three levels of water volume to choose make sure that only optimum amounts of water will be used for each wash. Fabric care is ensured using the 2 wash/spin speed combinations that help match the speed according to the type of fabric. Keep your light-colored clothes safe and your dark-colored clothes looking new with the wash cycles that are adapted to their specific needs. The washer also comes with a casual cycle system for regular clothes. The machine has an agitator type wash mechanism that tumbles the clothes around in order to wash them clean. The same mechanism allows the machine to completely rinse the clothes after a thorough wash.
You get up to 3 wash/rinse temperatures and 12 wash cycles to create the perfect wash according to the load. For dark colors, you can choose from rinse & spin, heavy, medium, and light soil, while cottons cycle allows you to wash clothes based on these three options: regular heavy soil, regular medium soil, and regular light soil. Though the machine runs at 630 RPM maximum spin speed, it doesn't make too much noise, thanks to the Quiet-By-Design feature. The RainShower feature and the water level indicator of the machine allows the user to save on water. With these mechanisms, the machine is able to use only the minimal amount of water for both washing and rinsing. This model comes in an elegant white on white finish that's neat. It comes in standard design, but nonetheless, offers a no-frills functionality at its best. The machine can fit in most spaces because of its compact design. The GTWP1000MWW also employs the PermaTuf II wash basket that ensures clean and thorough washing no matter what type of stain there is on your clothing. The galvanized steel cabinet also adds to its durable construction, while the rotary electromechanical controls, color lid instructions, and front serviceable feature make it very convenient and practical to user. The control panel on this machine is easy to learn and to operate. There are instructions on the lid that allow the user to learn how to operate the machine. The diagrams and instructions are easy to follow. The door easily opens and stays open while you are loading or unloading the laundry. It stays sealed as the machine operates and keeps the water and soap suds inside, thereby, preventing leaks. Considering its smaller capacity, the machine offers up to 12 wash cycles, making sure that you can have the perfect options for each load. When the right settings and options are chosen, this machine ensures fabric care while making sure that clothes are dirt-free and don't odor-causing germs. Some customers complain about the noise and the excess shaking of the machine while in operation. This washer has a limited capacity, which means it can accommodate less for every wash.